Good Dog, Want a Treat? Actually, this treat is for you … not your dog. 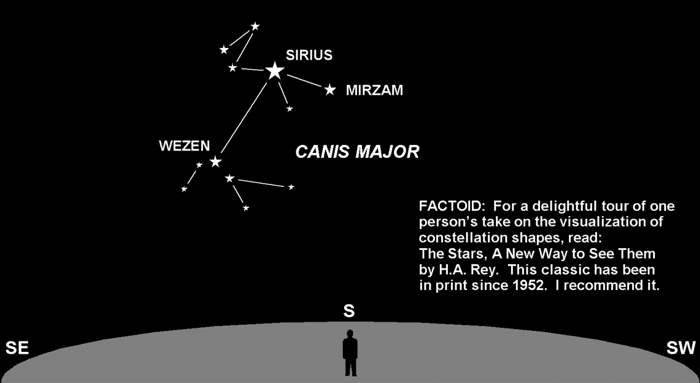 Canis Major, the “Big Dog,” is at its highest point in the sky. This is your best opportunity to see the Dog, since most of its stars are very faint and otherwise hard to find. One star in this constellation is quite remarkable. Sirius, seen by many (including me) to be the Dog’s “tag,” is the brightest star in our sky. It is a very hot blue-white star, some 25 times brighter than our Sun, and only 8.6 light years distant. Finding Sirius is the easy part; just look for the brightest star in this general direction. The way I’ve drawn the Big Dog is my own picture. There are so many faint stars in this group (not shown) that you could draw the animal in many ways. That’s one of the cool things about astronomy — the shape of a constellation is not like a law of physics, it’s whatever works to help you find your way around the sky. The boundaries of the constellations have been defined. Back in 1929, the International Astronomical Union (IAU) set specific borders, like countries on a map. But they said nothing about the shapes of the figures represented. How the dots are connected changes with time and culture. So look for the Dog, and draw your own picture. Choose your favorite breed and connect the dots. For me, the Big Dog is a classic German Shepherd.